All the Gear Is Here! 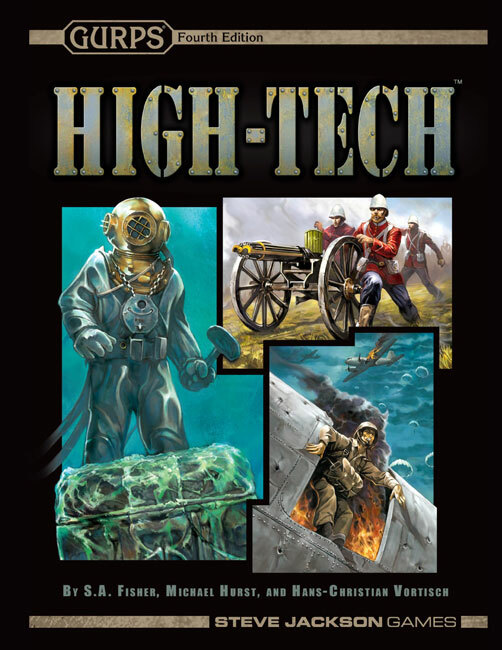 In 256 meticulously researched pages, GURPS High-Tech gives descriptions and stats for hundreds of kinds of historical weapons and personal armor, vehicles from the stagecoach to modern helicopters, and much more. GURPS High-Tech also has the gear and gadgets characters need. Communication, from early telegraphs to modern computers; tools of the trade for detectives, spies, and thieves; camping equipment, rations, and first-aid kits; business cards, watches, and fashionable duds – this book has it all, for encounters from the wilderness to high society and everything in between. GURPS High-Tech is the complete resource for equipment from the 18th century through the modern age, and will be appreciated by Game Masters no matter what system they use! 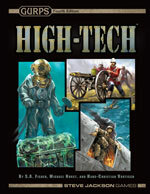 GURPS High-Tech replaces GURPS High-Tech for Third Edition, GURPS Modern Firepower, and portions of GURPS Covert Ops. GURPS High-Tech: Weapon Tables – 18 pages of just weapon tables, available in a single convenient PDF. GURPS High-Tech: Adventure Guns – Make the guns of the Wild West and Victorian eras come alive with this guide to weaponry from the mid-1800s to the early 1900s. GURPS High-Tech: Pulp Guns – Descriptions, anecdotes, and stats for just about every gun made famous – or notorious – by the cops, gangsters, and mecenaries of the '20s and '30s, both in the real world and in the larger-than-life world of the pulps. GURPS Low-Tech – A universal resource for any campaign set before the age of gunpowder and the printing press. GURPS Ultra-Tech – The sourcebook for science-fiction technology, from the near future to the farthest reaches of the imagination. GURPS Tactical Shooting – Features more rules and information on realistic guns and shooting. GURPS Gun Fu – Lets you slide across a marble floor with two guns a-blazing, with rules and information on cinematic gunplay. GURPS Underground Adventures – Contains a trove of additional subterranean gear and insight. Pyramid #3/65: Alternate GURPS III – Includes an article that features an optional overhauling of the Guns skill. Pyramid #3/70: Fourth Edition Festival offers Mass Combat – Contains a brief article of rules and options from High-Tech co-author Hans-Christian Vortisch. Pyramid #3/83: Alternate GURPS IV – Speed up your game with "Schrödinger's Backpack," where your gear doesn't exist until you need it! Pyramid #3/93: Cops and Lawyers – Delivers GURPS vehicles stats for two U.S. Coast Guard vessels.